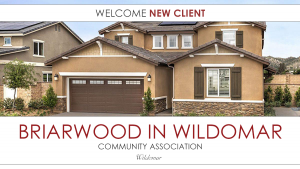 It’s our privilege to welcome Briarwood in Wildomar Community Association to Tinnelly Law Group’s growing family of HOA clients. Nestled in between the cities of Murrieta and Lake Elsinore, Briarwood features beautiful single-family and multigenerational new homes in Wildomar. Residents will be able to enjoy Briarwood’s community park and the natural scenic beauty Wildomar has to offer. Our HOA lawyers and staff look forward to working with Briarwood’s Board and management.